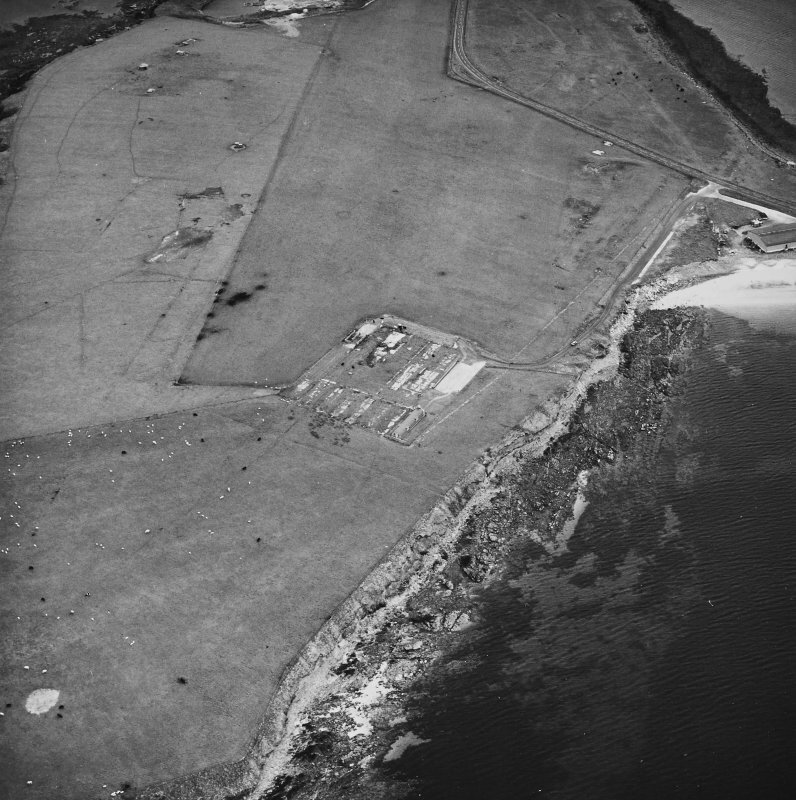 Oblique aerial view of Orkney, Lamb Holm, Italian Chapel and the remains of the prisoner-of-war camp, from W.
Oblique aerial view, Orkney, Lamb Holm taken from the SE. 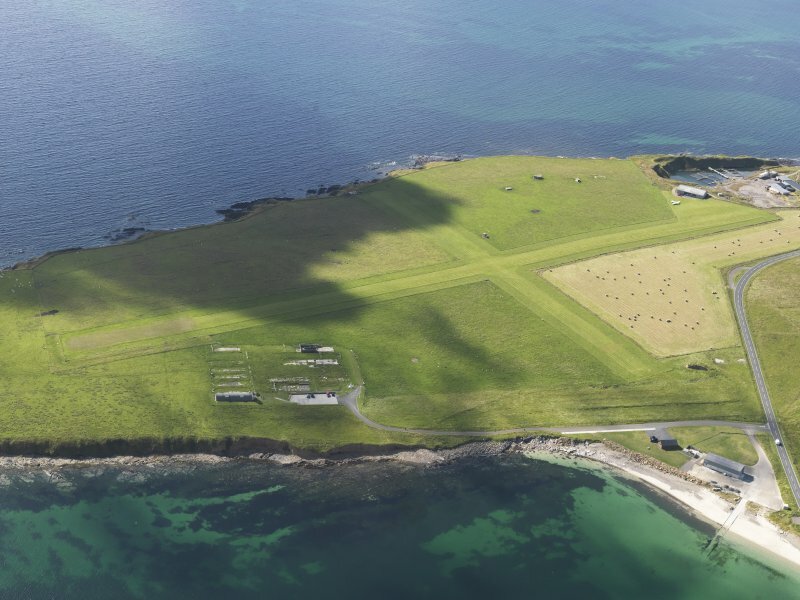 Visible is the modern grass landing strip, Lamb Holm World War II coast battery, the concrete hut bases of the former prisoner-of-war camp, the Italian Chapel and part of Churchill Barrier No.1. 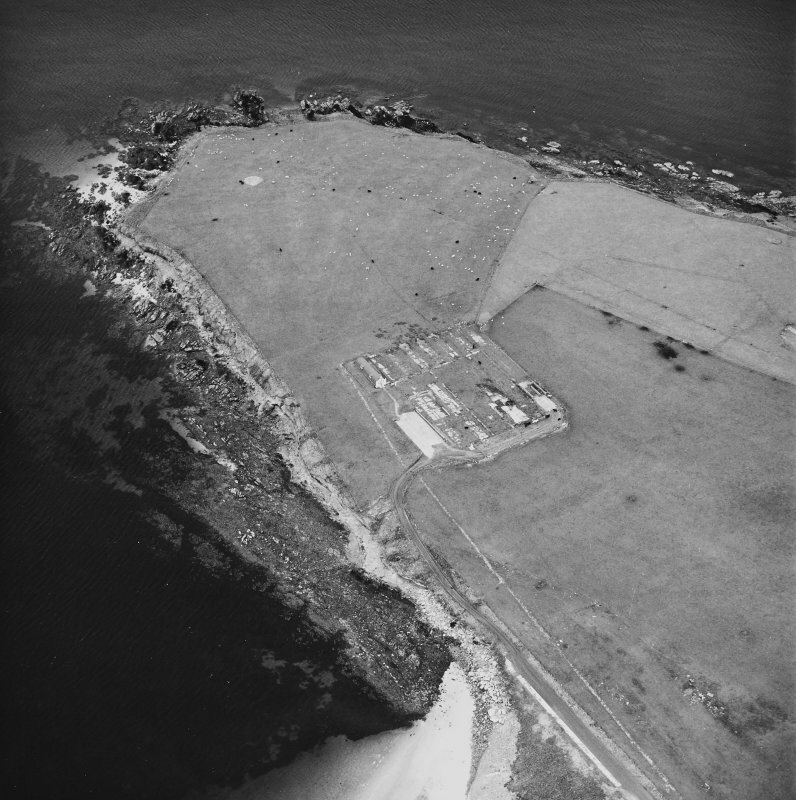 Oblique aerial view, taken from the WSW, centred on The Italian Chapel, and adjacent Military Camp. 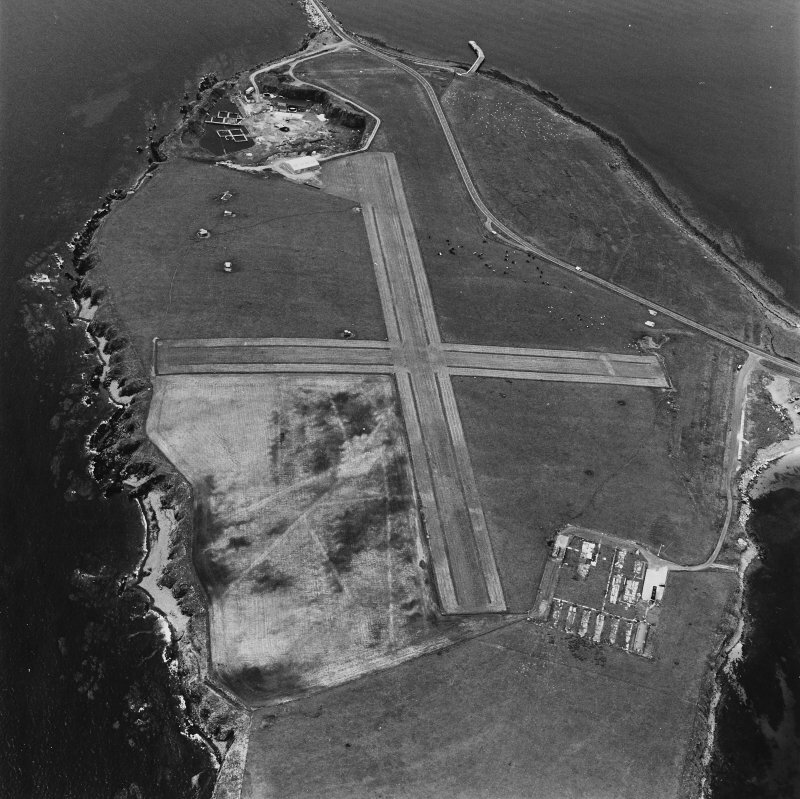 Oblique aerial view, taken from the NE, centred on The Italian Chapel, and adjacent Military Camp. 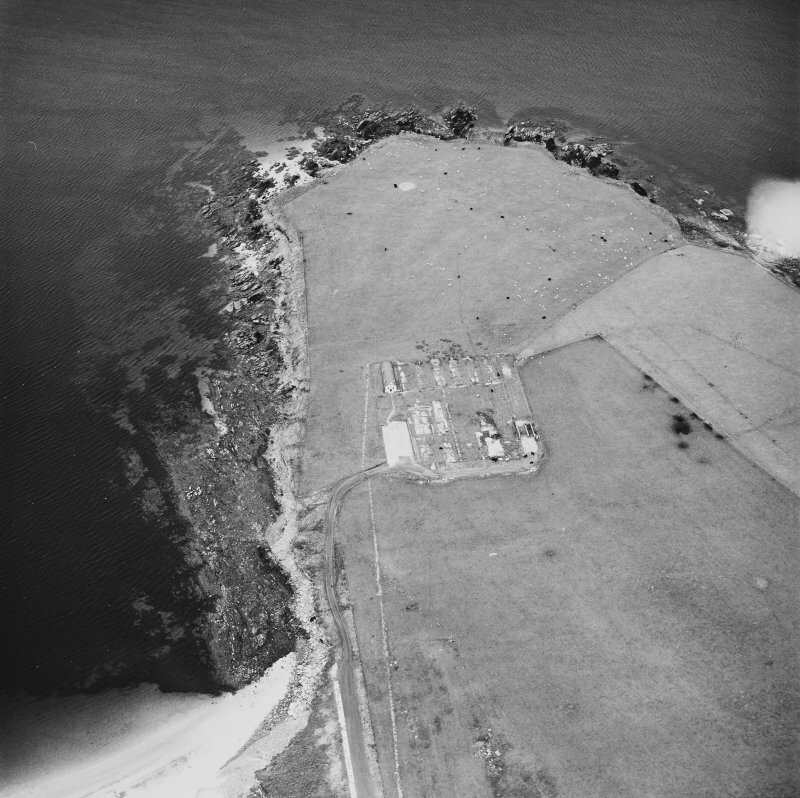 Oblique aerial view from ESE, centred on the Barrier, and showing The Italian Chapel, and the remains of Lamb Holm Military Camp, in the bottom right-hand corner of the photograph. 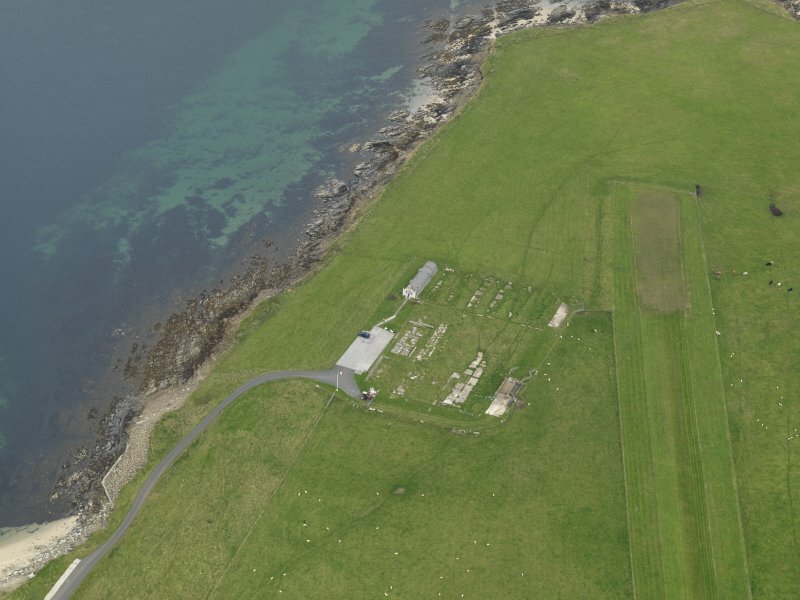 Oblique aerial view centred on the former prisoner-of-war camp with the Italian Chapel adjacent, taken from the SW.
Oblique aerial view of Orkney, Lamb Holm, Italian Chapel and the remains of the prisoner-of-war camp, from WSW. 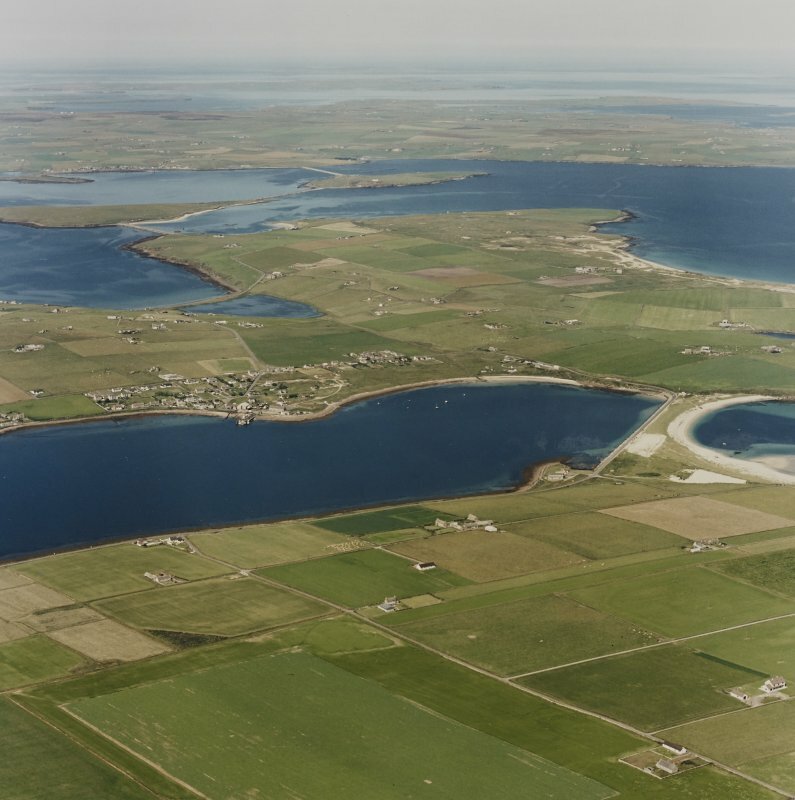 Oblique aerial view, Orkney, Lamb Holm taken from the SE. 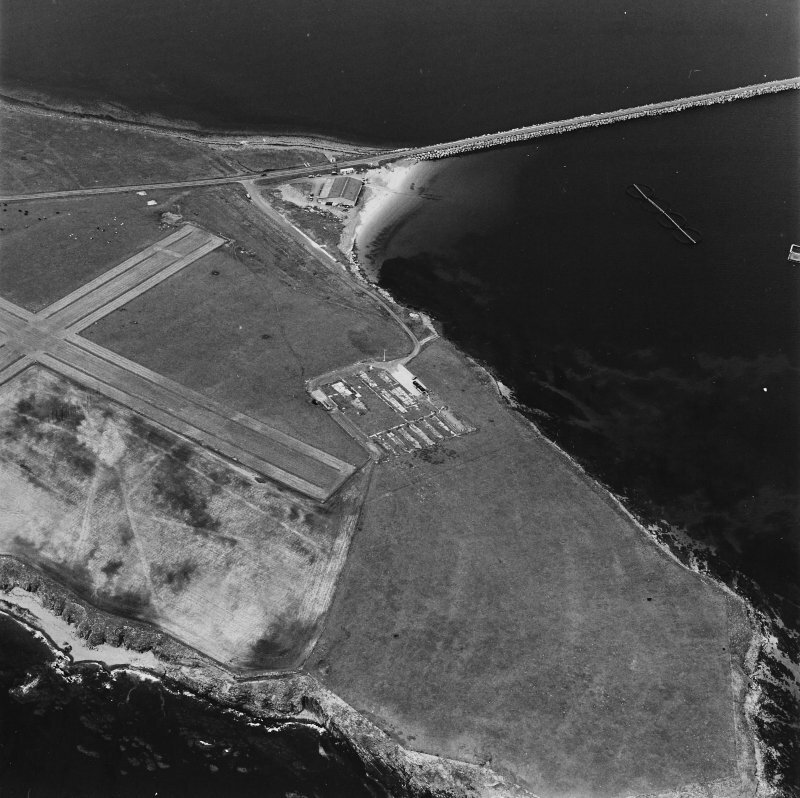 Visible is the modern grass landing strip, the concrete hut bases of the former prisoner-of-war camp, the Italian Chapel and part of Churchill Barrier No.1. 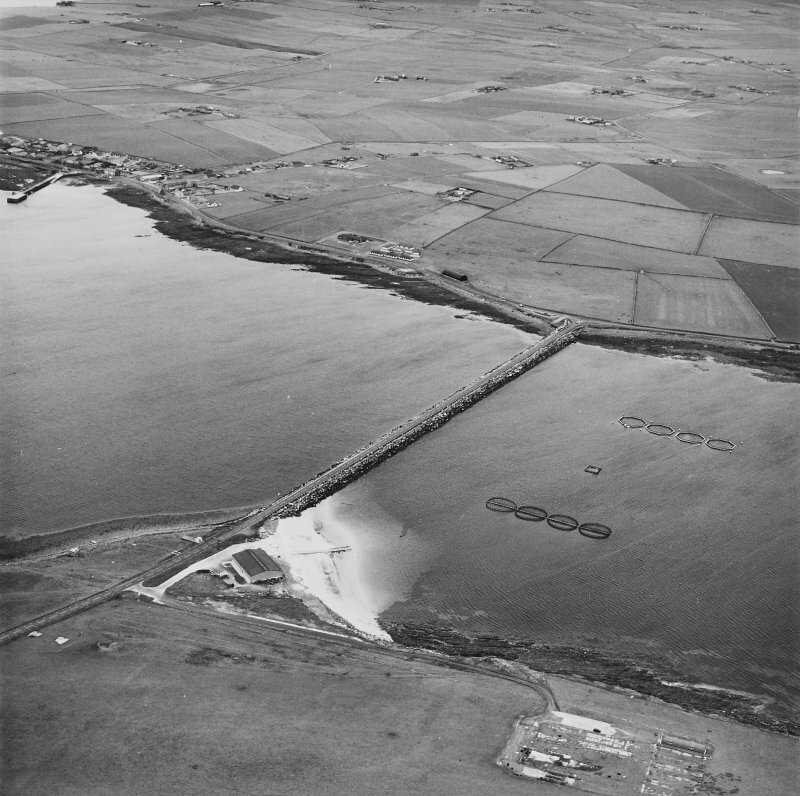 Oblique aerial view of Orkney, Burray, general view taken from the S of Burray, Burray village and all four Churchill Barriers. 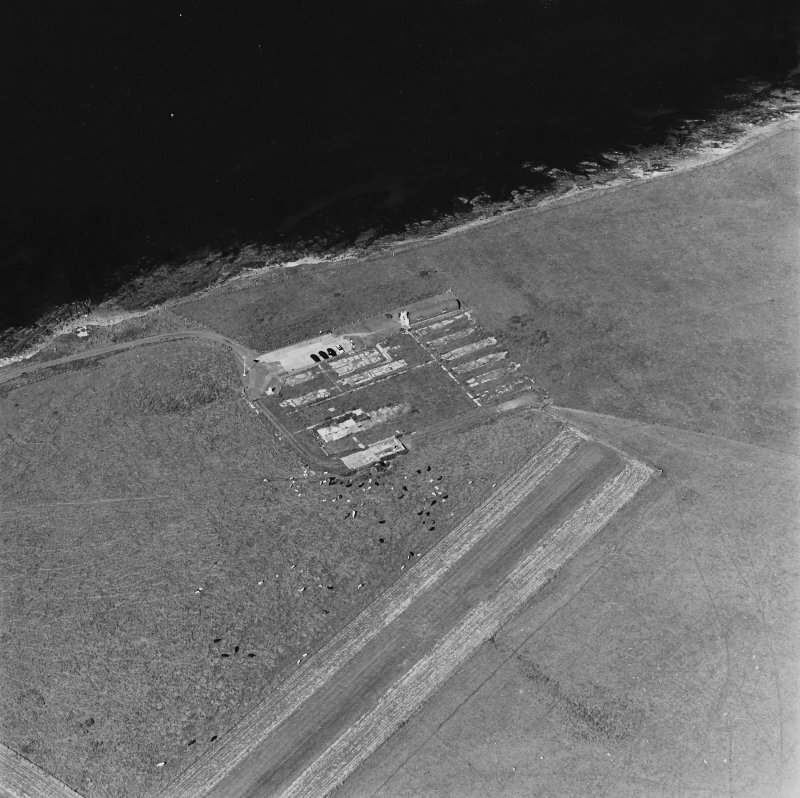 Oblique aerial view, taken from the WNW, centred on The Italian Chapel, and adjacent Military Camp. 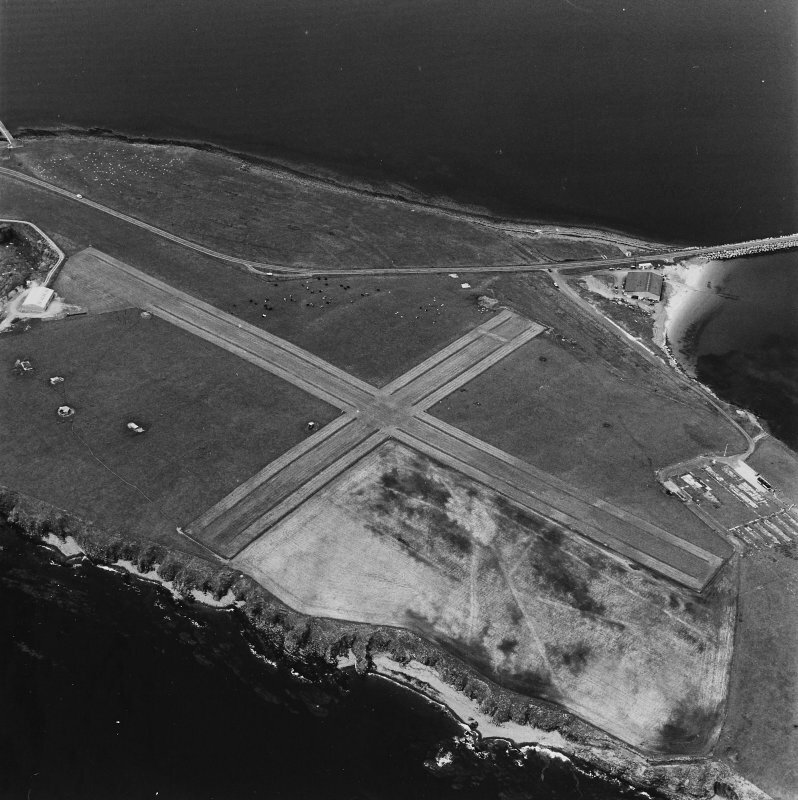 Oblique aerial view, Orkney, Lamb Holm taken from the NNE. Visible is the modern grass landing strip, Lamb Holm World War II coast battery, the concrete hut bases of the former prisoner-of-war camp, the Italian Chapel. 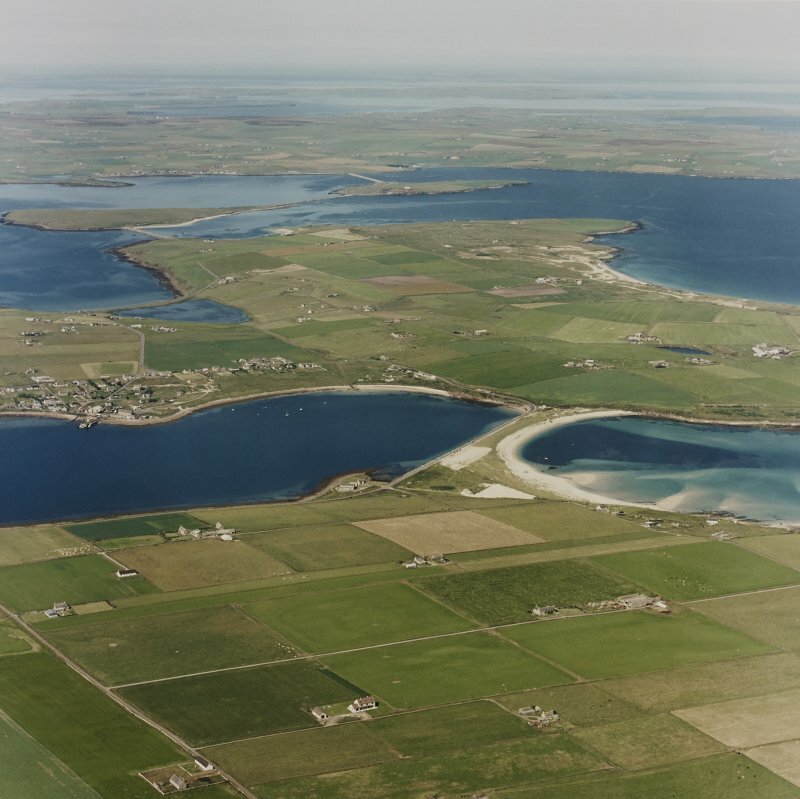 Oblique aerial view, Orkney, Lamb Holm taken from the NE. Visible is the modern grass landing strip, Lamb Holm World War II coast battery, the concrete hut bases of the former prisoner-of-war camp, the Italian Chapel and part of Churchill Barrier No.2. 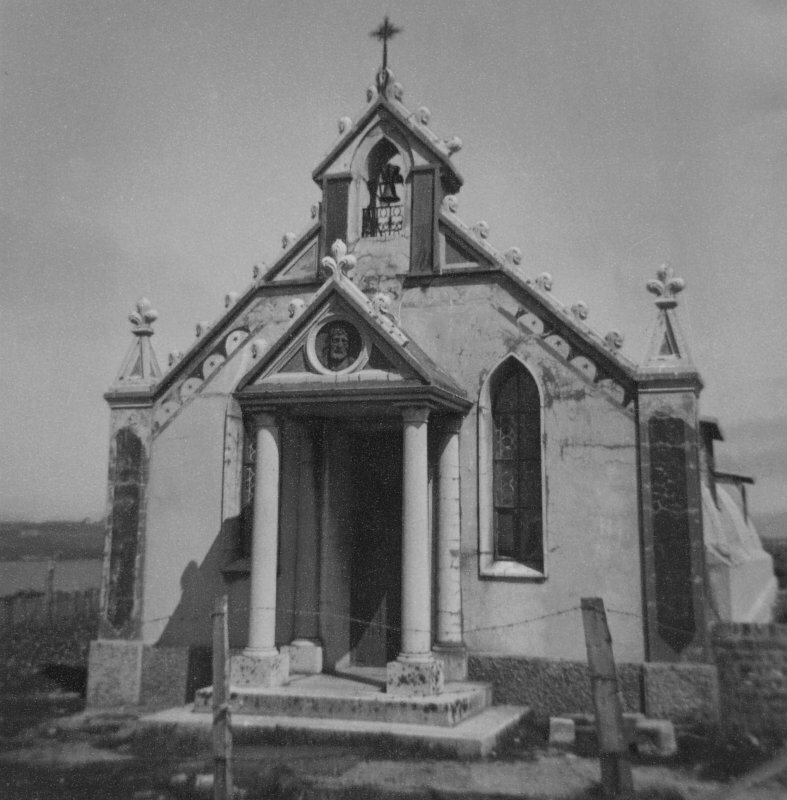 Scanned image of view of the Italian Chapel. Lamb Holm. 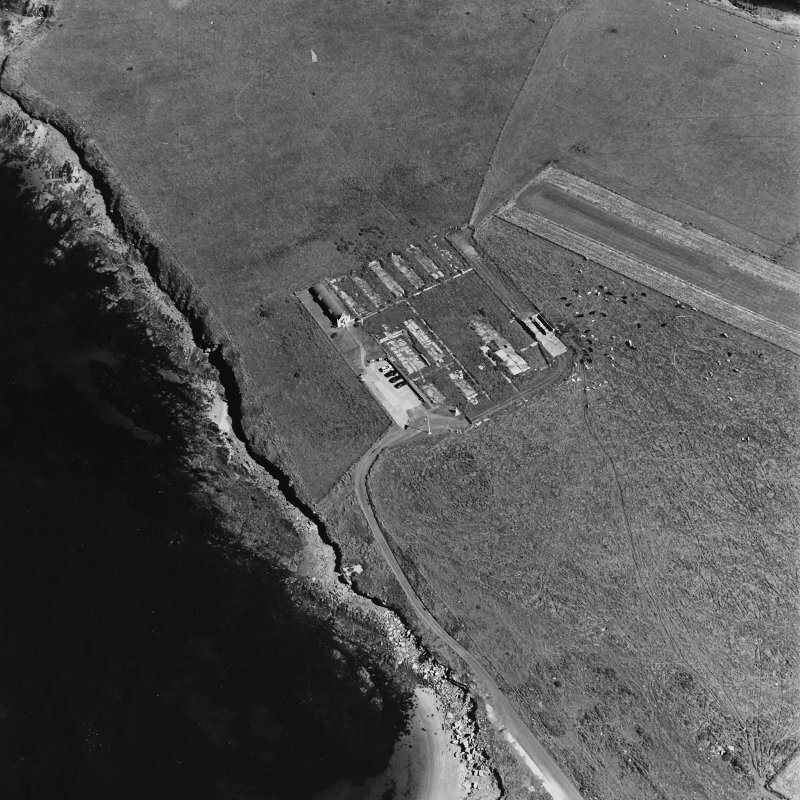 Oblique aerial view of Orkney, Lamb Holm, Italian Chapel and the remains of the prisoner-of-war camp, from SW.
Oblique aerial view of the airfield on Lamb Holm with the Italian Chapel in the foreground, taken from the N.
Oblique aerial view centred on the former prisoner-of-war camp with the Italian Chapel adjacent, taken from the WSW. 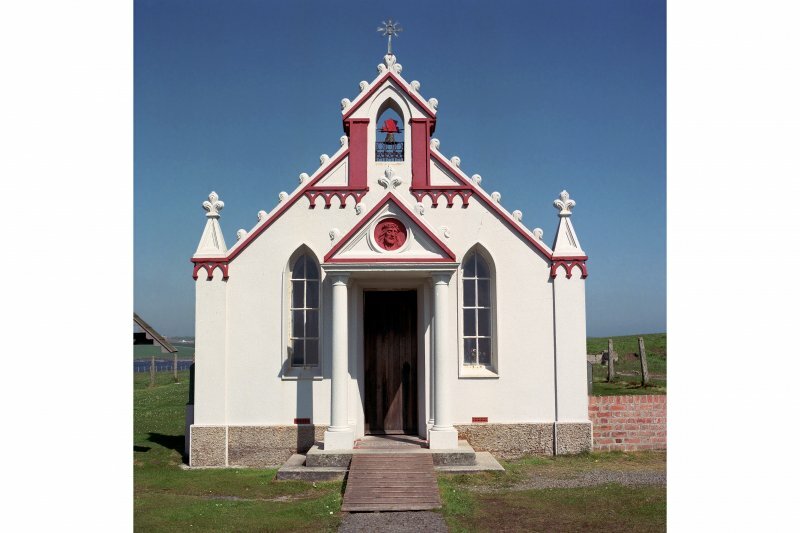 The Italian Chapel at Lamb Holm was created by Italian prisoners-of-war held at nearby Camp 60 during the Second World War. Behind the bright frontispiece, two conjoined Nissen huts are oriented east-west, in keeping with ecclesiastical tradition. 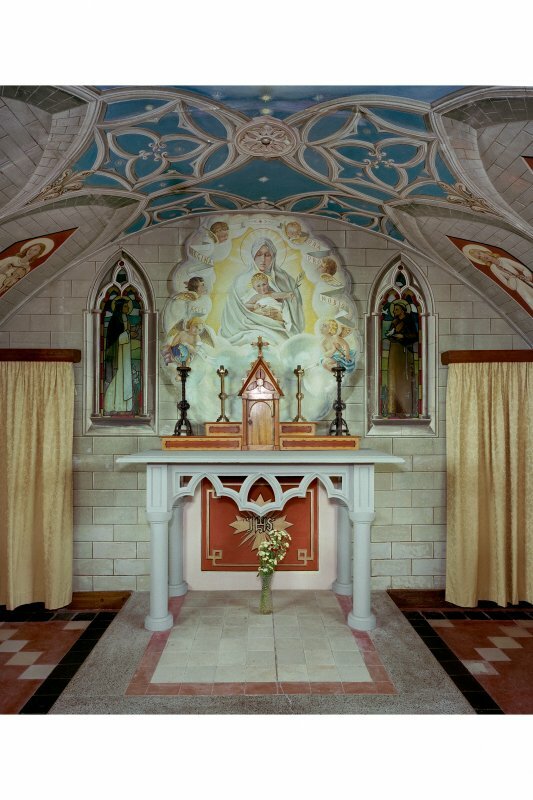 Inside the chapel, a 'vaulted' ceiling of painted plasterboard disguises the steel-ribbed structure of the hut. The altarpiece was painted by Domenico Chiocchetti, the principal creator of the chapel. For (associated) prisoner-of-war camp, see HY40SE 28. 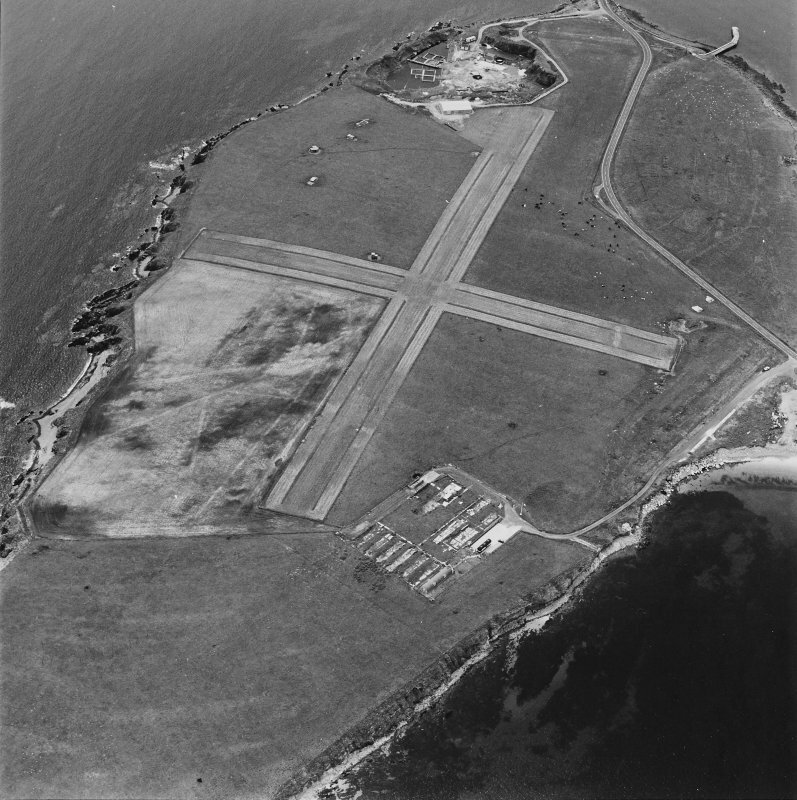 Visible on air photograph (OS 63/45/146, flown 1963). Double Nissen hut with barrel vaulted currugated iron roof, joined end-on is situated on the N shore of Lamb Holm. The W elevation has been given Doric columns supporting a pediment and there is a date panel at the entrance, 'A D MCMXLIV' and a pointed-arched bellcote above. Two pointed arched narrow windows flank the door. 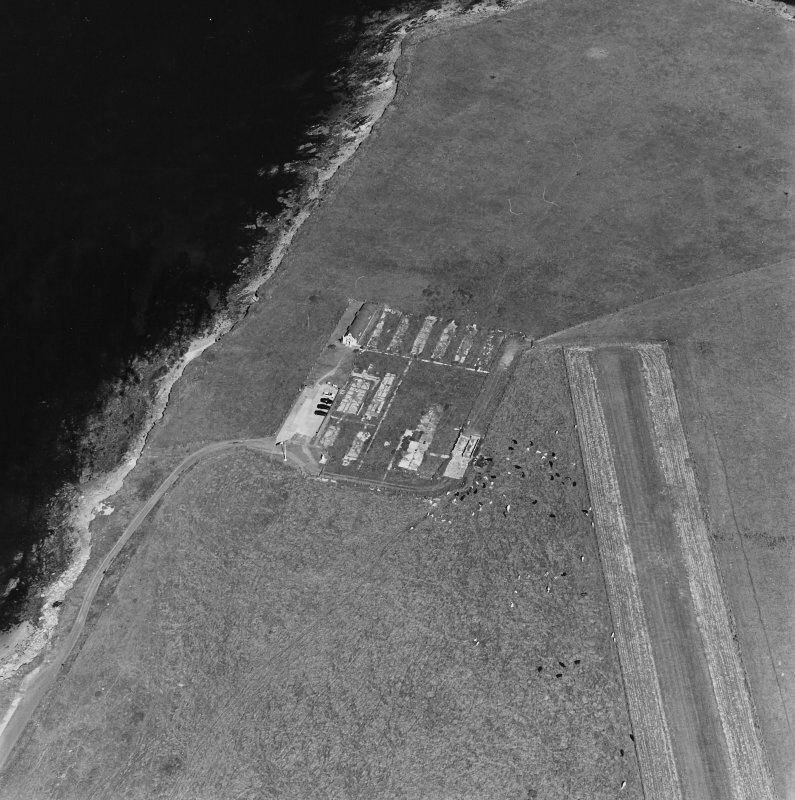 The huts are the only surviving upstanding structure from the Italian Prisoner-of-war camp 60 which stood to the S. The concrete bases for the huts are still visible in the field to the S. The remains of the camp are visible on a RAF vertical air photograph (106G/Scot/UK137, 3014, flown 3 July 1946). 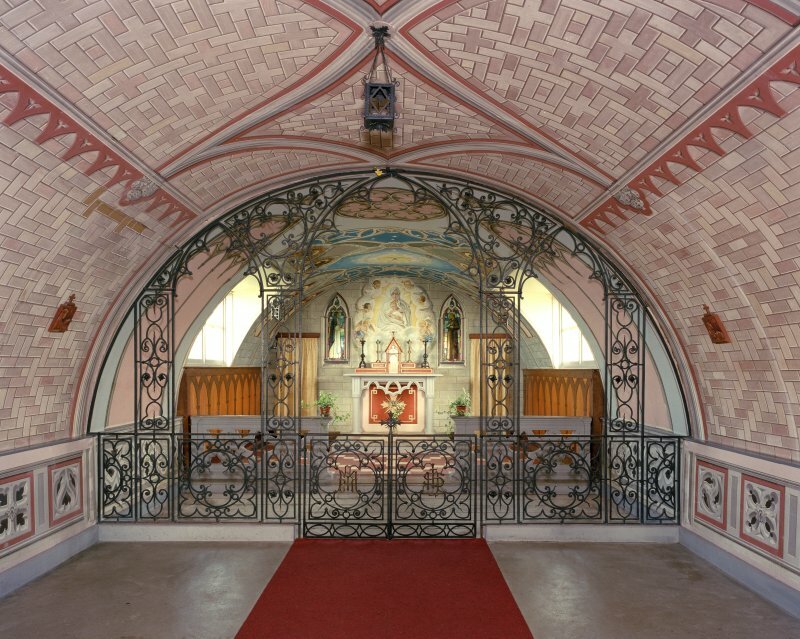 The huts were decorated internally for use as a chapel by one of the prisoners during the war. The huts were renovated in the 1960s. The principal creator was Domenico Chiocchetti. 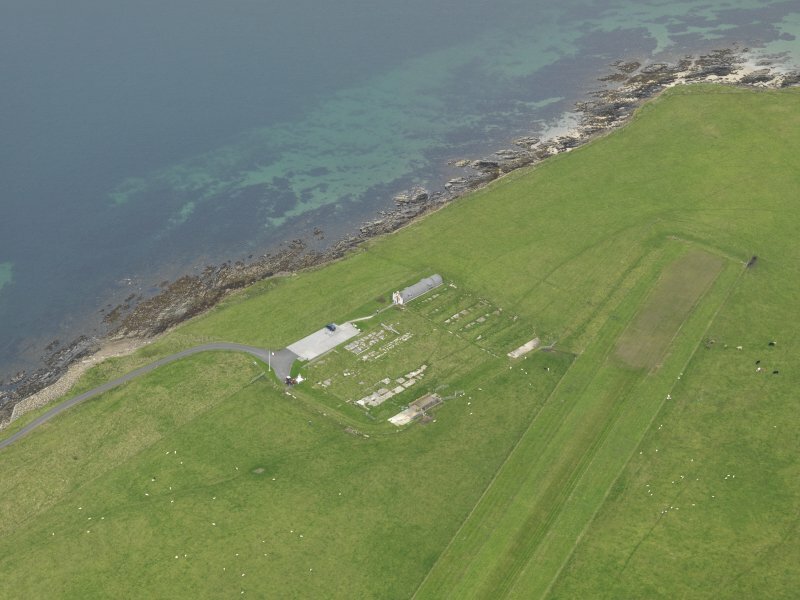 Domenico Chiocchetti returned to Orkney for three weeks to carry out restoration work. A carved figure of Christ was given to the island by citizens of Chiocchetti's home town Moena. The ingenuity and improvisation of the Italian prisoners-of-war who had worked on the Churchill Barriers led to the creation of this small chapel dedicated to Regina Pacis, the Queen of Peace (see p.29). 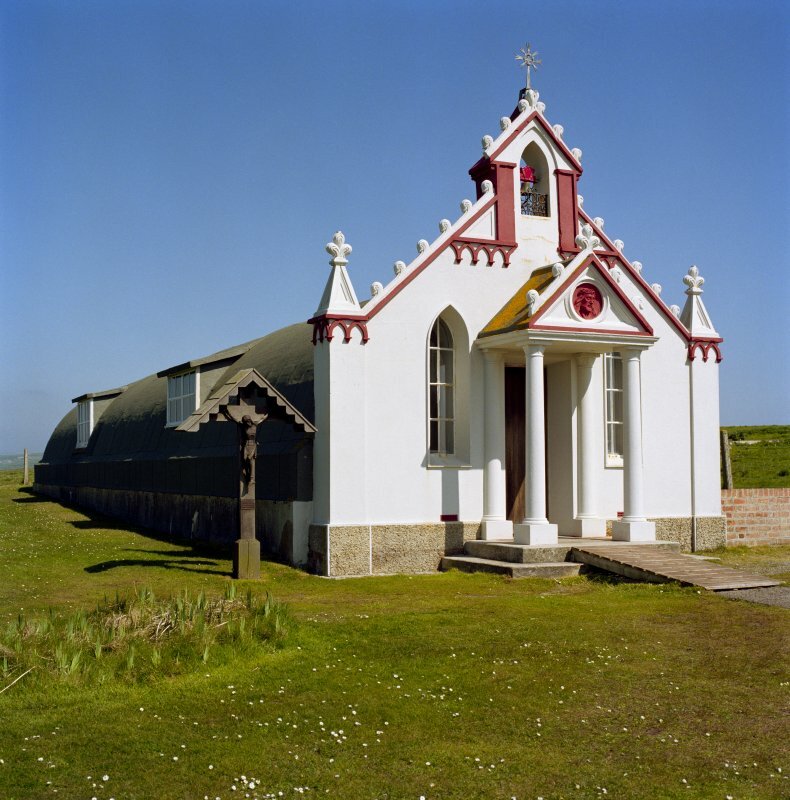 It was designed by Domenico Chiocchetti, an artist and church decorator in peacetime, and consists of two Nissen huts placed end-to-end with embellishments made largely from materials salvaged from the sea. The entrance has an elaborate facade with pinnacles and a bell cote, and the colourful interior is divided into nave and chancel by a beautiful wrought-iron screen. Behind the altar is a painting of the Madonna and Child, flanked by windows with painted glass, and the entire span of the vault is painted with finely detailed frescoes. The prisoner-of-war camp was already abandoned by the time that the chapel was finished in 1945, but, outside the chapel, there is a concrete statue of St George slaying the dragon which formerly decorated the camp 'square'. Within its base is preserved a roll with the names of all the prisoners. 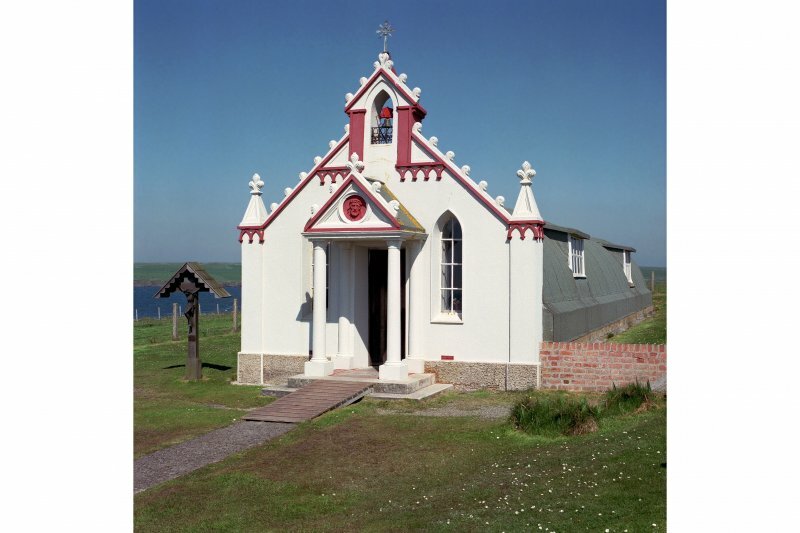 Through the efforts of local people, the chapel was restored by its chief creator, Domenico Chiocchetti, during a three-week visit in 1960, and it retains today a very special place in Orcadian memory of the last war.